I'm absolutely obsessed with fennel right now! The flavor is so fresh, and it is brimming with anti-oxidants that make it an extremely healthy addition to the menu. 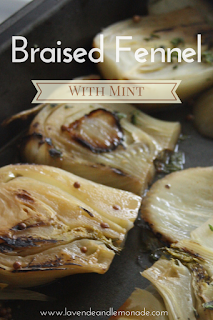 I love this recipe because it showcases a softer side to fennel. The braising tones down the hints of licorice that fresh fennel has, and instead brings a soft rustic flavor. I received a complementary copy of TWENTY DINNERS in exchange for my honest opinions. 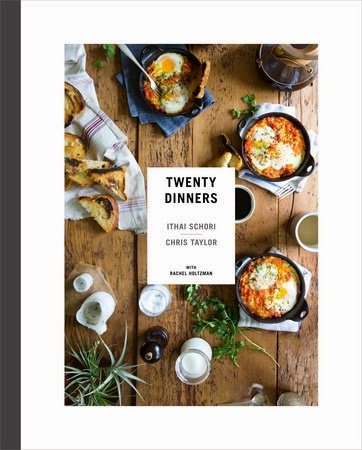 Twenty Dinners, by Ithai Schori and Chris Taylor, is just what the title implies - a complete menu for twenty dinners sorted by season. Many of the recipes are complex but a few like this one are simple, healthy, and perfect for a weeknight dinner. The recipe says it is for 4, but that is as one of several side dishes. Feel free to up the quantities if this will be a more central part of the meal! When braising vegetables - or anything for that matter - you soften them slowly and gently in liquid, which deepens their flavor. Normally fennel's crunchy texture and bright, licorice-like flavor make it seem more like a warm-weather vegetable, but bathed in a warm oven for 30-40 minutes, it becomes sweet and woodsy. Add some mint and it's a subtly refreshing accompaniment to deliciously fatty pork. Trim the fennel where the bulb meets the fronds. Chop and reserve some of the fronds to use later as a garnish. Slice the fennel bulb across its "waistline" to get relatively thick rinks, about 1/2 inch thick. Get a large cast-iron skillet hot over a high flame, add enough oil to coat the bottom, then add the fennel. Cook until it just starts to brown, about 3 minutes. Meanwhile, warm the thyme and coriander seeds in the bottom of a roasting pan over medium heat. Pull them off the flame once you smell them, about 1 minute. Add the wine and stock to the herbs. Raise the heat to high and bring the mixture to a boil. Salt the liquid to taste. Add the fennel rings in an even layer at the bottom of the pan. Reduce to a simmer, cover the pan with foil, and put it in th eoven. Cook until the fennel is softened but still has a little crunch (you don't want total mush), 35 to 40 minutes. 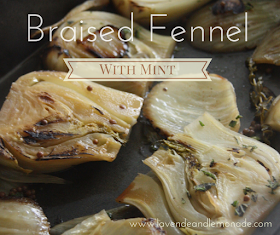 Remove the fennel from the pan, toss with the mint, and garnish with some of the reserved fronds. Thank you to TWENTY DINNERS for sponsoring today's discussion.